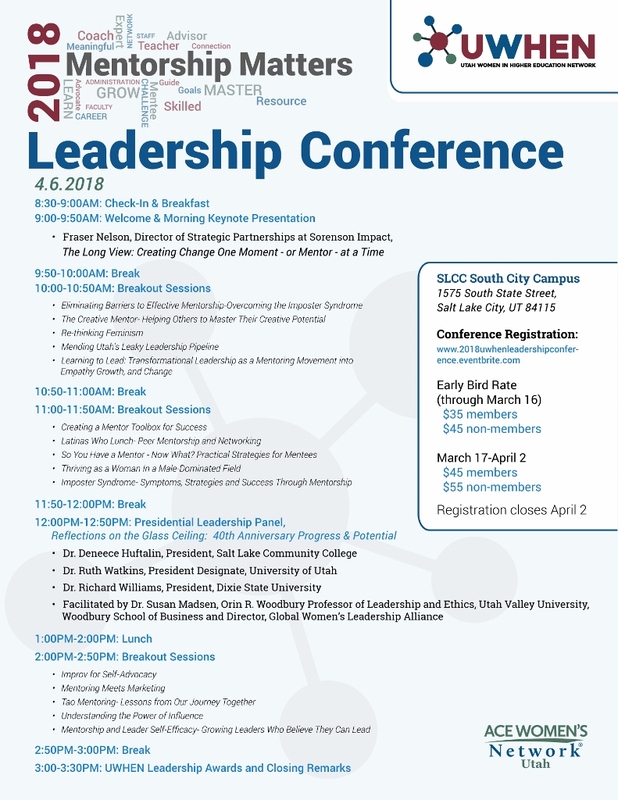 Registration is now open for the 2018 UWHEN Leadership Conference, which will be held on Friday, April 6, at the Salt Lake Community College South City Campus. The Conference is applicable for all women employed in higher education, including staff, faculty, and administrators. This year’s Conference emphasizes mentorship and feature dozens of excellent speakers on subjects supporting UWHEN’s mission to advance women’s leadership on our campuses. Additionally, UWHEN will be presenting its inaugural Leadership Awards! Bring your colleagues and join us for an inspiring and educational event! Download the full program here. Seats are limited, so register early to reserve your seat early at https://2018uwhenleadershipconference.eventbrite.com!